The Bureau of Land Management (BLM) has recently announced that it will permit oil and gas drilling by hydraulic fracturing (fracking) in the Marietta section of the Wayne National Forest. The proposal, which would release 1,600 acres in 33 lots to the environmentally destructive process, has been met with ongoing opposition from environmental groups. What the mainstream press has not reported is that 9 of those 33 lots are within a half mile of the Little Muskingum or Ohio Rivers. 5 of those seven lots are withing a quarter mile and all are within four miles of one of the two rivers. Hydraulic fracking drives wells up to two miles long horizontally through shale formations to shatter deep rocks and release oil and gas. The Muskingum River is a tributary of the Ohio and Ohio River supplies drinking water to Cincinnati and Louisville amongst others cities. The BLM is practically giving the land away to large oil conglomerates. The lots will be auctioned to secret bidders on December 13th. The auction winners will be required to pay $150 plus $1.50 per acre for the first five years and $2 per acre for the next five. They will be required to pay 12.5% of the wholesale value of the gas extracted, allowing them to pump when the price is low and sell when the price is high for huge profits. The lots vary in size from 33 to 62 acres and average around 40 acres or 1/16 of a square mile. The average ten year lease on a lot would be $450 total, or less than the labor cost to the taxpayer of processing the paperwork. All but one of the lots is in Monroe County and the vast majority are in Jackson Township. Monroe County is directly across the Ohio River from Marshall County West Virginia. Marshall County is the only County in West Virginia that the state has issued permits to frack directly under the Ohio River to the The Norwegian energy giant Statoil ASA (NYSE: STO). Statoil was convicted of violating the Foreign Corrupt Practices Act in 2006 in Federal Court for a bribery scandal involving payoffs to enter Iran's energy production market. This sale of leases can be seen as an extension of Statoil's under the river fracking as two of the proposed lease are within a quarter mile of the river across from the Marshall County town of Sisterville West Virginia. Sisterville is home to West Virginia's annual Oil and Gas industry festival, which features industry exhibits, rides, games, funnel cakes and a beauty pageant of prepubescent elementary school girls. One of the leases is within sight of the Sisterville Country Club. Statoil already owns fracking wells in Monroe County but outside of the Wayne National Forest. In June 2014 one of these wells, operated for Statoil by private military contractor Haliburton (NYSE: HAL), caught fire. Haliburton's firey disaster caused a spill of toxic fracking chemicals into the Ohio River killing over 70,000 fish. Haliburton and Statoil are not required by law disclose what chemicals they use in the fracking process as these are protected trade secrets. Of the other three leases located directly on the Ohio River one is located downstream from Sisterville and the other two are upstream across from Paden West Virginia. Paden, unlike Sisterville, does not host a festival where aging male oil executives celebrate ramming horizontal pipes into the earth and pumping until rock shatters while judging eight year old girls in tight dresses. The lease auction is the culmination of years of hard work by Republican Congressman Bill Johnson (USAF LTC ret.) of Marietta Ohio. 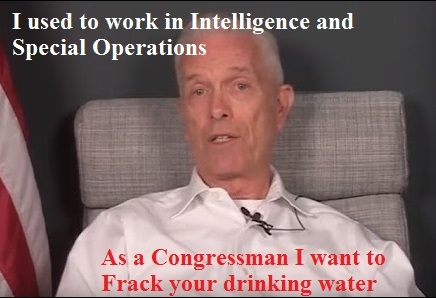 Johnson, who sits on the House Energy Committee is a former special forces officer and liaison for the United States Special Operations Command to intelligence community and Congress. He has championed oil and gas exploration in the national forests as a defense of private property rights. The release of 1,600 acres is a fraction of the 33,000 acres of Wayne National Forest Land the Forest Service had hoped to peddle to the fossil fuel industry. That amount was reduced earlier this year to 18,000 acres and this auction is the first of many giveaways of public lands for a fraction of their values slated to happen in Ohio in the coming years. Industry publications were ecstatic at the news. “It’s been 10 looooooong years, but finally the Bureau of Land Management (BLM) has just posted a lease sale auction for 33 parcels in Ohio’s Wayne National Forest (WNF). Although there is some 18,000 acres under consideration for leasing by the BLM in WNF, this first batch amounts to about 1,600 acres–most of it in Monroe County, OH.” said the fracking industry website marcellusdrilling.com.